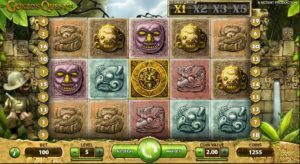 Meet one of the most popular slots machines from the NetEnt provider – Gonzo’s Quest. Be blown away and take yourself for a trip to Eldorado, fill your pockets with golden coins and celebrate! Gonzo’s Quest is a bit different from the other NetEnt slots – instead of spinning reels we have falling symbols. Every time you will hit the win – winning symbols will disappear and new symbols will fall from the top – giving you the chance to hit another combination, NetEnt calls this feature – avalanche. What is great about Gonzo’s Quest slot? It’s the multiplier, which will boost your winnings with every avalanche you get with a winning line! In Free Falls game round multiplier is even higher and it will take your winnings to the next level. wild symbol – it can appear anywhere on the reels, it will substitute for all symbols – even for the scatter symbols! You can hit them during the normal play mode and also in the free fall mode. free spins – free falls in Gonzo’s Quest can be won if you will hit three golden scatter symbols, they need to be on the pay line, starting from the left side. Each bet line with free fall symbol will activate 10 free spins. You can win even more free falls during the free spins round if you will hit another combination of golden symbols. multiplier – every time you hit a win your winnings will be multiplied – a maximum multiplier that you can get in normal play mode is 5 times, in free falls you will start with multiplier x3 and maximum that you can get it’s 15 times. This game is listed in our TOP 50 slots from NetEnt with highest RTP! Also now you can claim free spins completely for free and use them in Gonzo’s Quest. Our partner – LuckyDino Casino is giving away free spins for all new players! Join Gonzo in his adventure with this free bonus and get your next pot of gold.